I was on line and saw these cute and easy ways to make our own gift boxes and I thought I’d like to share these with you. Christmas is right around the corner and truthfully, it’s not just Christmas time that we often find ourselves needing a gift bag or box to put a gift in for someone. Hope you enjoy these sites. My friend Linda taught me how to make these. They are truly easy and adorable for Easter baskets, baby baskets, children’s crafts, display on bathroom counter. I found a website I thought you may like. I am a beach person. I love the ocean and even more, I love collecting seashells. I have my master bathroom decorated in a beach theme. 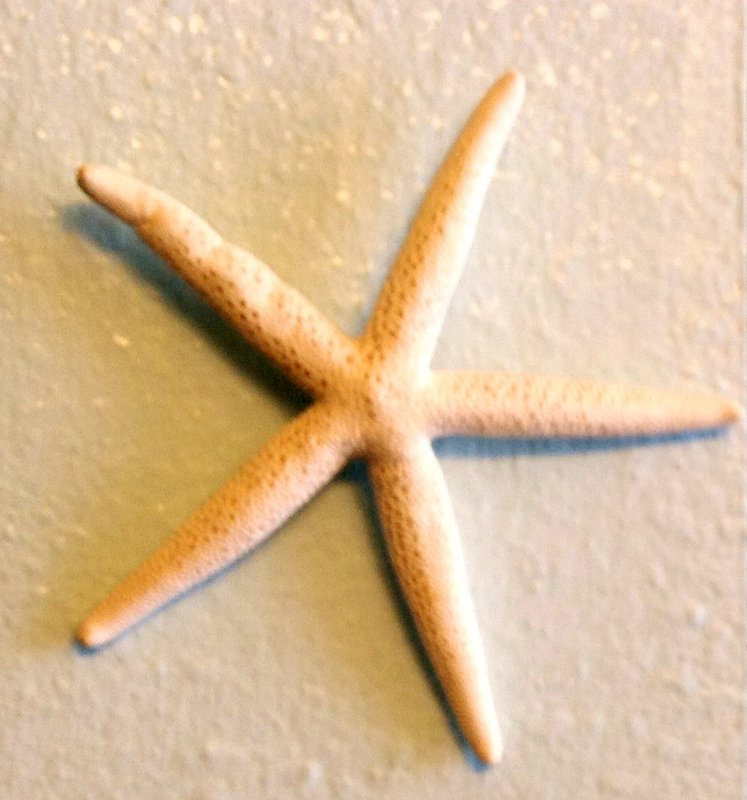 I have clear glass jars of seashells displayed on the windowsill and wanted a starfish for the wall. This is what I did. Hope you’ll give it a try! So easy! Takes just a few minutes. A Starfish ( or more if you want several) these can be purchased in Walmart or any craft store, individually or in a bag . White pipe cleaners or a wire ( when I run out of wire I have been known to use a Christmas tree ornament hanger for these small tasks). Either leave natural or paint your starfish white and apply glitter. 2. Hot glue pipe cleaner to back center of starfish to hang on wall. NOTE: There are some on a shelf in my guest bedroom that just rest against a book or other item. Large clay pot or ceramic pot with drainage hole. 1. Take your hand and put it at the base of the top greenery and hold firmly. 2. Twist the bottom of the pineapple as far as you have to, until the plant part comes off. 3. Take each bottom leave and pull toward the bottom till it falls off. Continue doing this all the way around until you have pulled off five to six rows of leaves. 4.Place the plant in a container with only enough water to cover the part without leaves. 5. Keep an eye on the water level as it soaks up water pretty easily. Change water daily. 6.Once you have good roots, place in a large clay pot. NOTE: In a few days you will see roots. If you buy a very ripe one or let it ripen well in your home before you twist the plant off, roots will already have started growing. The picture I have posted is after two days in water. I twisted top off after pineapple was yellow and many roots were already growing. Have fun! If you want them to bear fruit, be sure to plant a few in your garden so they can be pollinated. In this ever worsening economy, it’s going to be good to know how to grow our own foods. If you don’t have a garden, even potted, it still is a great looking plant! 1. Paint entire rock black and allow to dry. 2. Take back of larger brush and dip into a different color paint. 3. 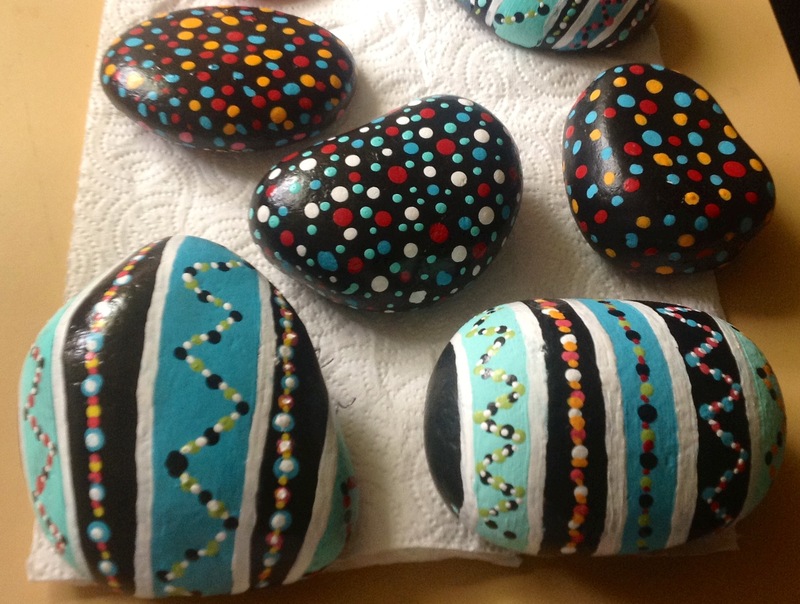 Randomly place dots onto stone surface then switch color and continue dotting rock until it looks as you wish it to look. 4. For a different effect paint different colored stripes down rock. Once dry take toothpick or wooden skewer and dip into paint and dot in a design. 7. Once dry, spray with clear spray paint to protect your painted surface. These make lovely paperweights. Or something to sit on a shelf. If the rock is large enough you can use for a doorstop too. However, when Christmas finally arrives, my expenses and workload are minimal because I have most of my homemade gifts already made. 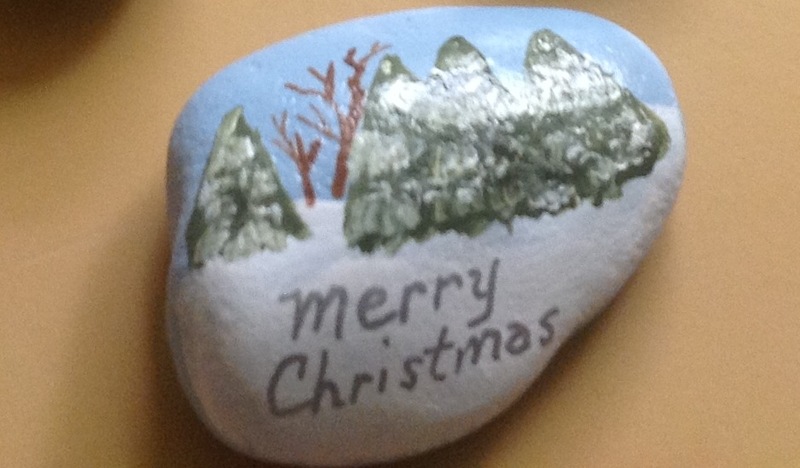 I recently decided to try my hand at rock painting. Wouldn’t you know it? After painting a few I thought, ” Oh, maybe I could make some for Christmas!”. 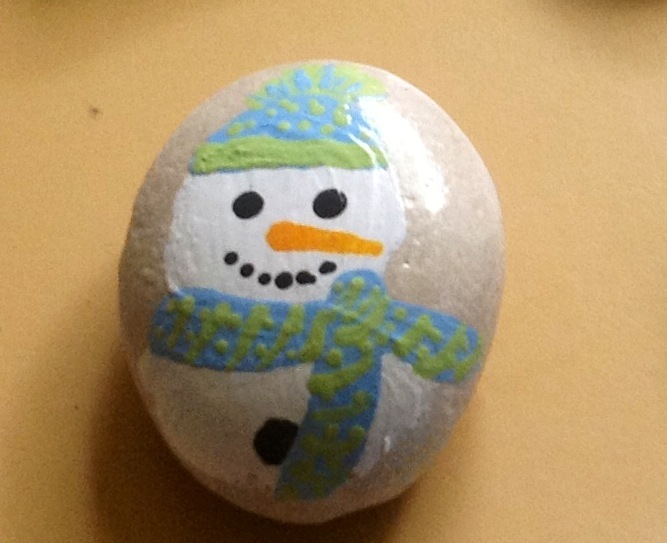 So here are a few of my designs for Christmas Rocks. What would you do with them, you ask? I have no idea. But I’ll tell you what I plan to do with mine. Stocking stuffers that can be brought out and placed on a table or desk every year, refrigerator magnets, shelf decorations. You are limited only by your imagination. Most people love homemade gifts. This is one that can have people thinking of you each time they see it. 1. Wash stones and allow to dry on towel or paper towels. 2. 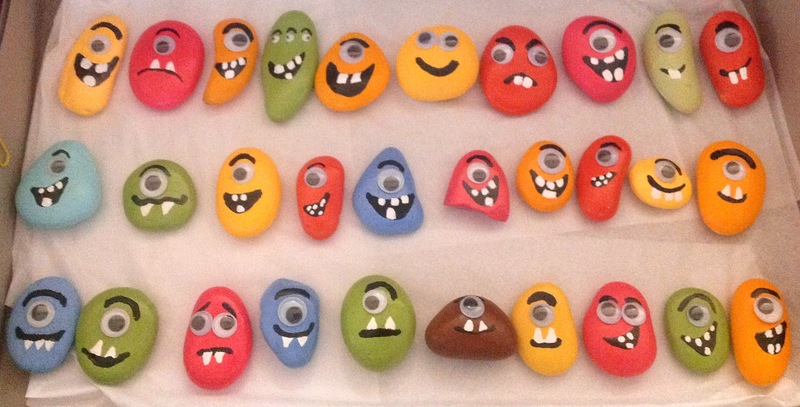 Paint entire rock the color of your choice. 4. 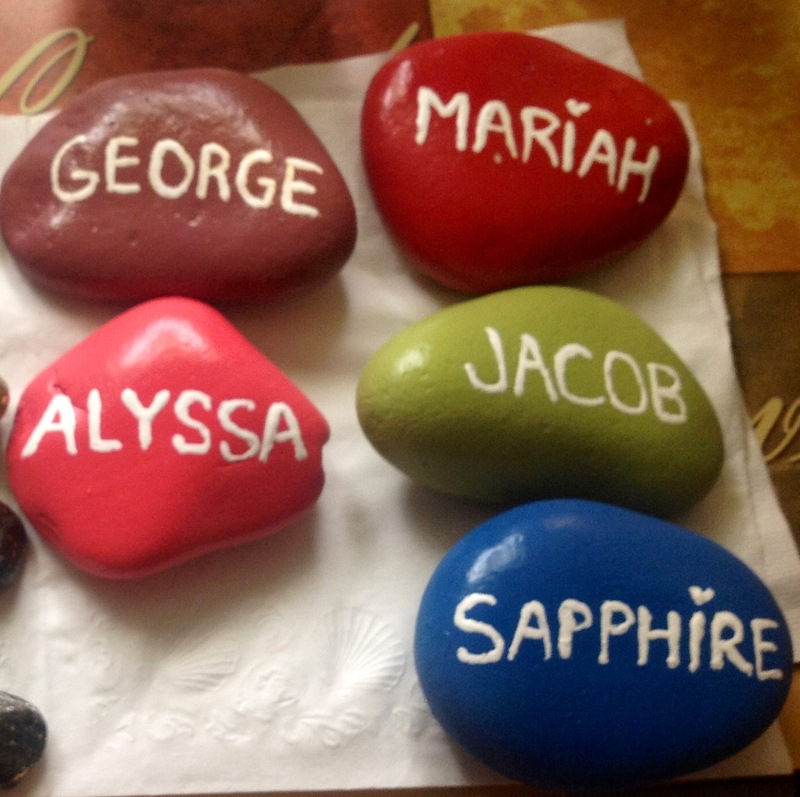 Once stones are dry, spray with clear spray paint to protect your stones from the sun and rain. 5. Place in garden or along a path. ****VARIATIONS*** You may have children’s hands painted with craft paint n place their palm print on stone as well. 3. RED ACRYLIC CRAFT PAINT (or what color you wish your scarf to be but remember, you will need red for reindeer tongue if you choose to have open mouthed smile). 13. DARK BROWN PIPECLEANERS (for reindeer antlers. 2. After you are satisfied with the coverage of the coats of tan paint, let dry. 3. Begin painting the scarf color on the rim . (I found it easier to hold my other hand inside flower pot and turn as I painted). Paint till you have the coverage that you like . 4. Turn the flower pot upside down and set down as you would a normal flower pot, so you can paint the very edge of the rim with the scarf color and let dry. 6. Once it has completely dried, if you are not using google eyes, put small amount of black paint onto paper or old plastic lid and take back of small brush handle and dip into black paint to dot eyes. Then in a circular motion you draw eyes the circular size you wish them to be OR use larger handled brush to make dots for eyes. where smile will end on each side. Then make a semicircle smile or make an open mouth to show tongue and/ or teeth. Let dry completely resting again on towel to keep straight while drying. 9. Once eyes are completely dry, if you have not opted to use google eyes, dip pointy end of toothpick into white paint place dot or apostrophe shape ( ‘) into eye in same place on each eye to mimic shine. Let dry. 10. Dip pointy end of skewer into black paint n draw eyebrows. Again, place onto towel to keep straight till dry. 11. Then take toothpick, dip into red paint and make tongue inside open mouth if you chose to have open mouth reindeer smile. Once that has been laid flat to dry, you can then add teeth if you so desire. 12. Insert 2 dark brown pipecleaners into hole of pot and bend inside of pot. Then pot some hot glue on end of skewer to place under bent pipecleaners so they may stick to pot. Bend antlers as desired. 13. Hot glue ear muff colored pipecleaner across top of flower pot hole and down side to where your Pom Pom earmuffs will be. 14. Hot glue ear muffs where they should be. 15. Hot glue google eyes in place. I found it easier and less messy to put tiny glue dot or tiny dab of hot glue on back of google eye and place onto pot. Remember, just tiny amount so that when you press google eye into place, no glue will be seeping out from around eyes . You can personalize reindeer by dipping skewer into black paint and putting name or greeting across front of scarf.